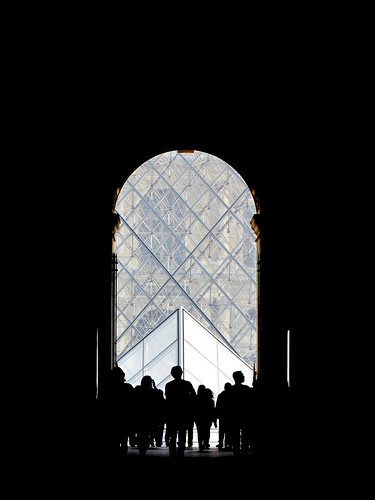 Given a mention of Paris and Impressionist art, most would think Musée d’Orsay right off the bat. I don’t blame them. It is a magnificent museum and perhaps my favourite among the many in this city. 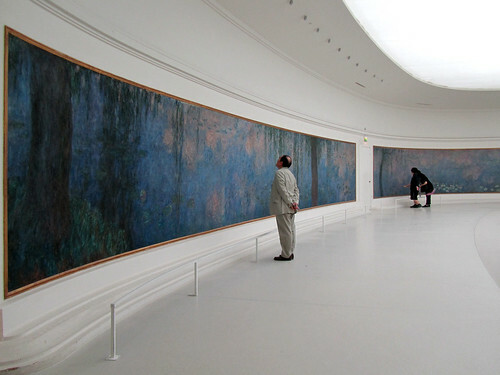 However, just across the Seine, there is a smaller museum that boasts a quaint collection of Impressionist art. It’s a pity that this place is often overlooked by visitors but for me, that’s good news because it means it’s never too crowded at Musée de l’Orangerie. Culturally, I’ve been taught that cemetery is one place you don’t go to unless (1) it’s part of funeral/burial ritual, (2) it’s a designated prayer day, and (3) it’s dictated as part of specific ceremony. My grandma would be horrified to know that I’m visiting one as if it’s a place of attraction. However, in Paris, that’s what some of them are considered. You could even get a map that marks out the graves of the “stars” of the cemetery. Perhaps there’s an energy of morbidity around. 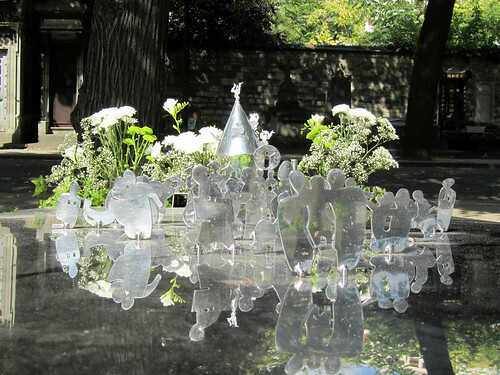 With Hungry Ghost Festival taking place soon, and having just visited an exhibition on Voodooism at Fondation Cartier, it seems natural to take a walk at Cimetière du Montparnasse nearby. Truly, it’s a very well-kept compound, with a sense of calm and zen. It is also fascinating, given it’s a multi-denominational cemetery, with interesting and varied monuments setting one grave aside from another. Just look at the one above. It could have easily passed for an art display anywhere, if you discount the other graves that you could see in the background. 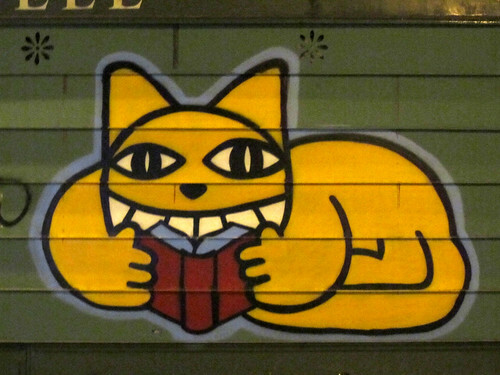 I’ve walked rue Bonaparte quite regularly, thanks to the presence of a number of delicious shops along the street, but tonight, for the first time, I spotted this Mr Chat. Of course I don’t see it during the day, since it’s hidden within the shutters of this shop, lowered only after close of business. The risk of dreaming is loneliness? 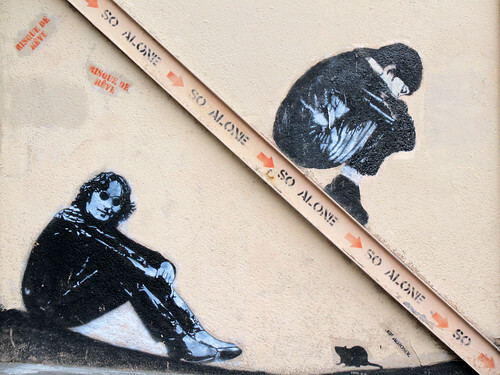 At least that the hypothesis postulated by Aerosol in this art-graffiti wall of his. Dream is a two-edge sword. On one hand, we could not not dream. To not have dreams is to live a monotonous existence, without anything to look forward to and nor something to aspire for. At the same time, to dream also means to put ourselves in a state of fantasy, imagining something that we may put too much hope on, and hurtful when it’s misguided. What we should aim for is a balance between the two. Afterall, isn’t much of our lives about balance in one way or another? Too much of something is bad enough, too much of nothing is just as tough. 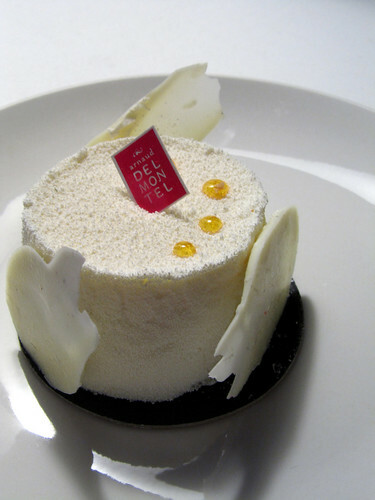 However, I don’t see loneliness in either scheme of dream. Am I missing some obvious link? The city is becoming void of locals as everyone goes away for their summer holiday. Its effects be seen everywhere. Shops closed for their congés annuels, less passengers on the bus (still plenty on the métro though, which tourists feel more secure taking than buses), free flowing traffic for a change… When August rolls in, there would be even more who leaves Paris. I wonder if there would be more tourists than residents then? The marketing team behind this poster has quite a sense of humour. 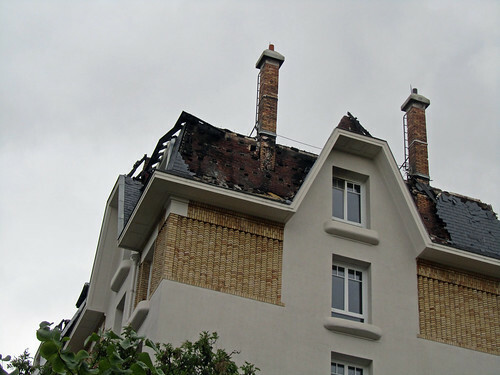 The mairie is currently encouraging its residents and visitors to appreciate the green spaces and tropical woods surrounding the city. They are not wrong you know. There are a lot of beautiful green spots in Paris that one could explore, and I don’t mean just Luxembourg or Tuilleries Gardens. 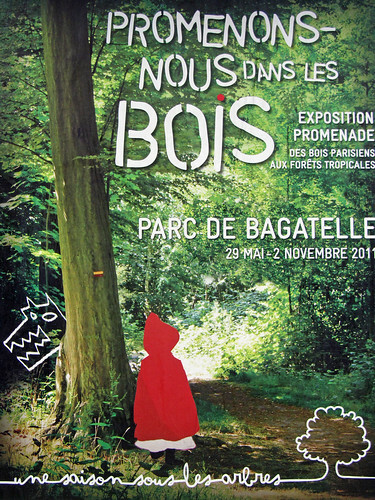 In particular, the focus is on Parc de Bagatelle, Bois de Boulogne and Bois de Vincennes. 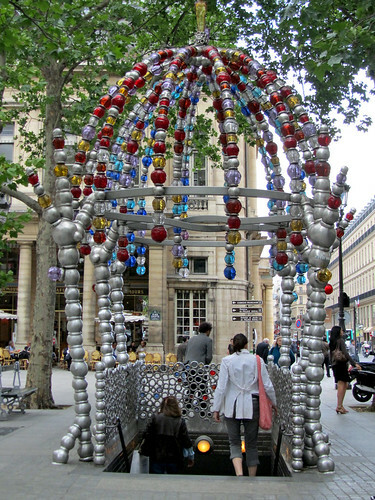 The very first time I walked past the kiosque des noctambules (sure, I didn’t know the name back then either) I was perplexed by its colourful bejewelled state (who installed a glass bead-like art sculpture here?) and then noticed people coming up from underneath. Curious. A quick investigative effort revealed that it is the entrance to the métro station of Palais Royal-Musée du Louvre. A contemporary art piece by Jean-Michel Othoniel, it was commissioned for the centenary celebration of the inauguration of métro in Paris. First introduced in 1900, métro line 1 was used to transport visitors of the city to enjoy the sites and sights during the Exposition Universelle of 1900. Back then, the line runs between Porte Maillot and Porte de Vincennes and Palais Royal-Musée du Louvre was one of the eight stops of the line. Pretty steep in history eh? 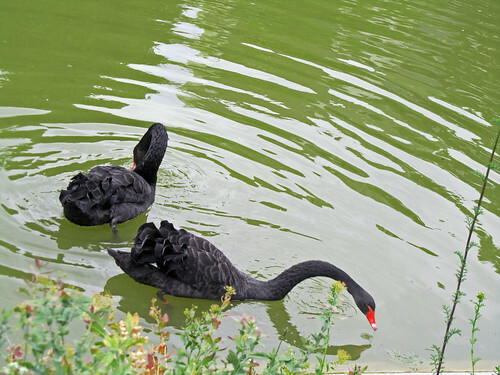 There is a pair of black swans at Parc Montsouris with bright red bills. This is rather unusual, as the swans normally spotted around this part of the world are white. A quick wiki check told me that black swans are more commonly found in Australia and New Zealand. I can only assume then this pair is part of introduced population? It is a veeeery long way to migrate from Oz to France otherwise. While I was there, park visitors were amusingly throwing grass in to feed the swans. A woman even remarked “Do you think they eat grass? I hope they won’t get stomach ache.” Well, seeing the swans are herbivores, I’d say they’ll be alright. Sure, the grass is not the same as vegetations found in the lake but it’s not too far off either. Eat, swans, eat.